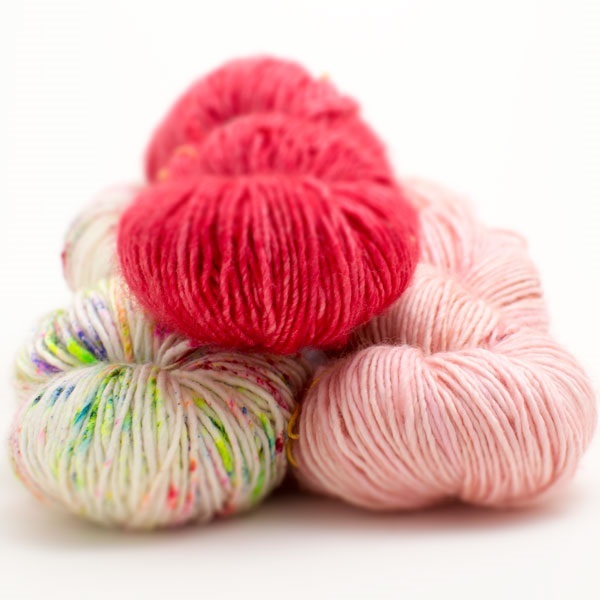 Home › Free Patterns › Easter Treats from Loop – and a Free Pattern! Hippity Hop! Guess who’s coming? 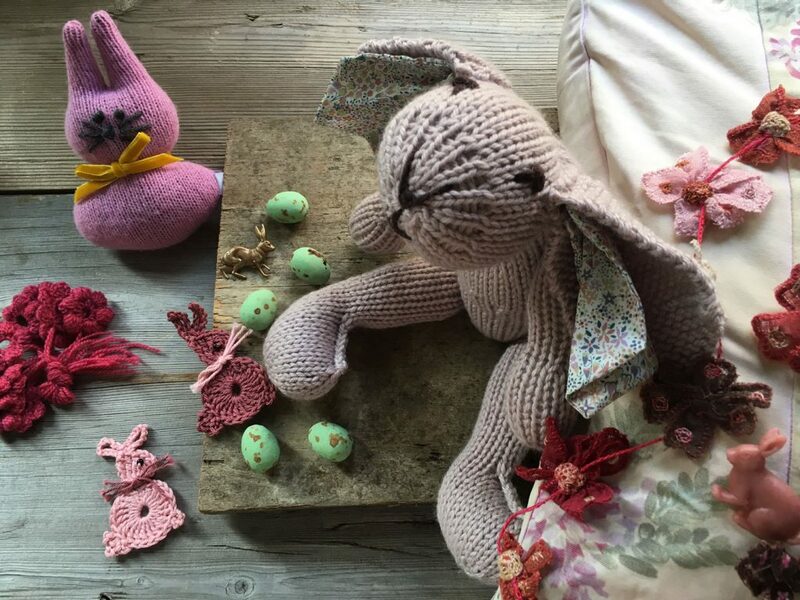 Easter is just around the corner, so we’ve rounded up a selection of our favourite Easter inspired treats, including a free crochet pattern for you! but we also have lots of lovely gifts, for unique Easter treats. This adorable bunny resin brooch is only £6.00 and comes in several Easter egg colours. I pick up pins like this to fasten fabric bags that I make for gift giving or egg gathering (pillow cases and kerchiefs will do in a pinch). They also look pretty wonderful to fasten on your knitted or crocheted shawls. 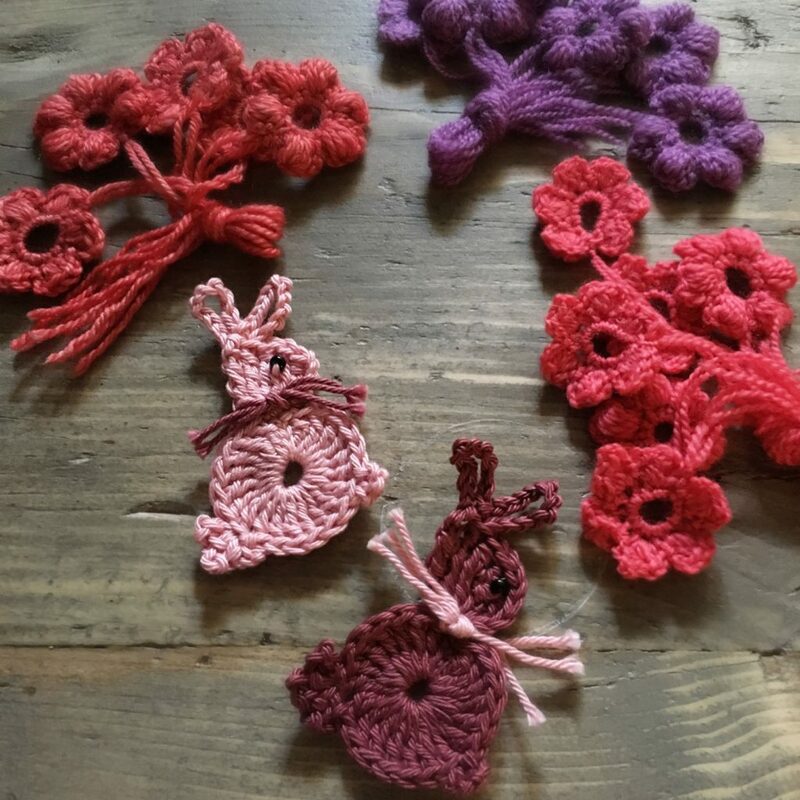 We made the crochet flower garland from Rachel Atkinson’s ‘Whimsy Garland’ pattern in Loop’s 10 anniversary book. It’s lambing season! 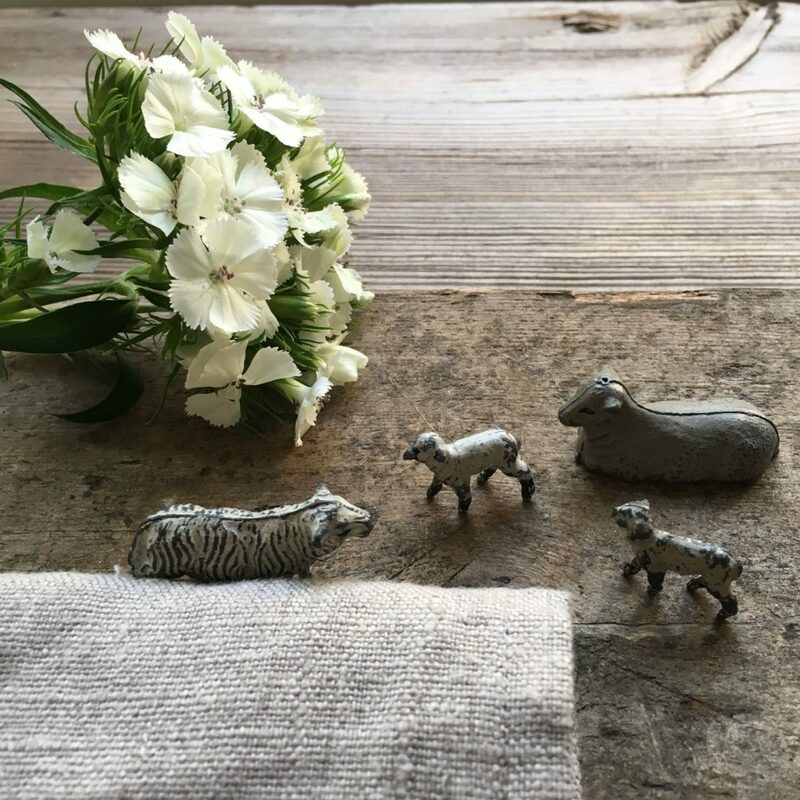 We also sell the vintage lead sheep, which may not be suitable for small children, but look sweet in a windowsill with a little posy of Spring flowers. Has that whet your appetite? We have more. 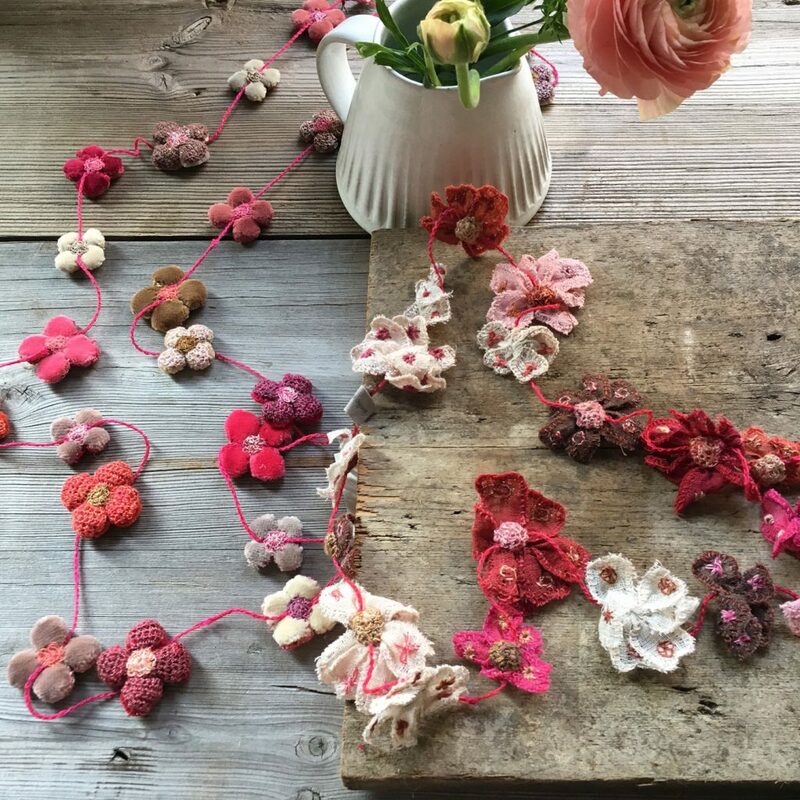 Wouldn’t these Sophie Digard handmade necklaces feel like a celebration of Spring? They are embroidered, crocheted and appliquéd. They’re so charming, and will look good with outfits throughout the summer and into next autumn. You can see more detail here. They’re crocheted from a melange of yarns, giving them unique colours. The velvet petals are stuffed and hand stitched. We have a lot of bunny buttons; you could clothe an Easter Pearly Queen in them! Above are pink and blue buttons in the shape of rabbit heads. We also sell these more grown-up brown bunny buttons. 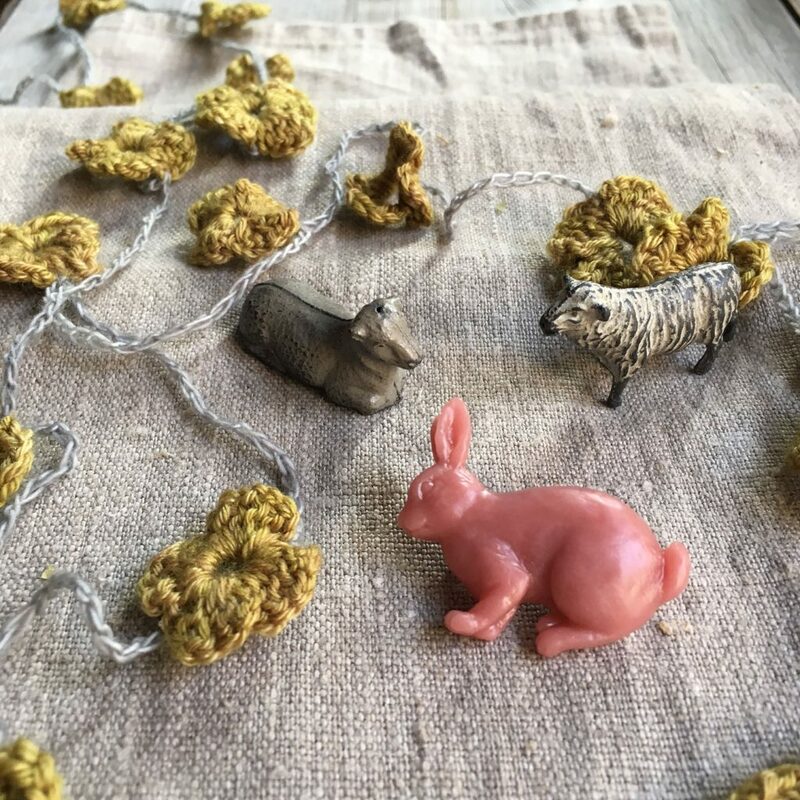 Another sweet brooch is this bronze hare, which would look nice fastening a spring shawl. The ribbon is hand dyed canvas with bird motif stamps. These wooden chick buttons are my favourite for a small (or fully grown) person’s cardigan! 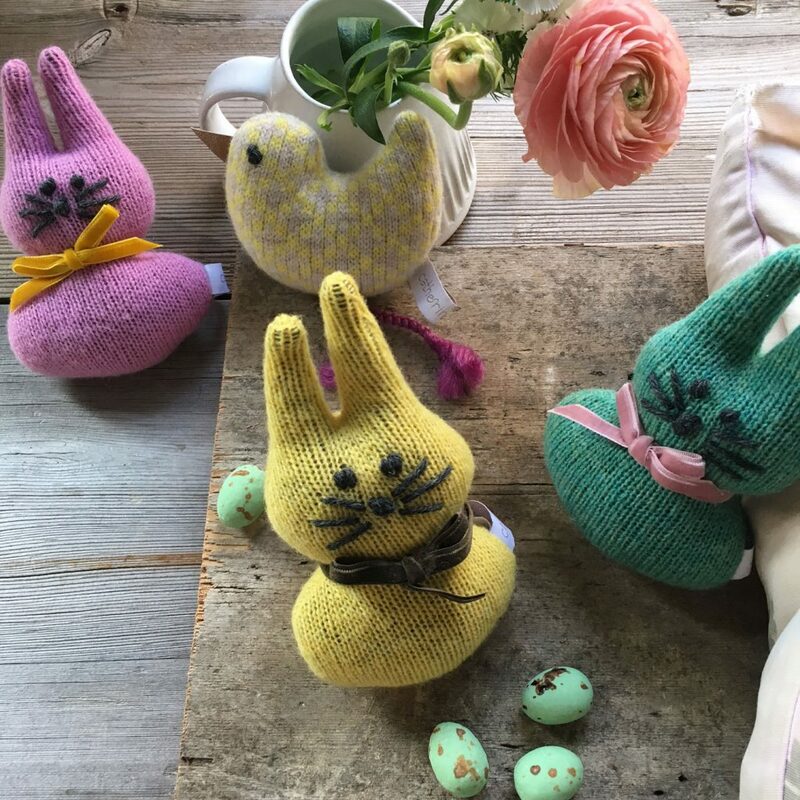 Catherine Tough makes knitted, woolen bunnies and chicks, filled with lavender. They make a great addition to a room that’s been freshly spring cleaned or perched on top of a special guest’s pillow. If these have tempted you to knit your own bunny, we sell kits for the cute guy below. They come with all the wool, stuffing, fabric, and needles you need to make him. If you haven’t got time to make your own, we also sell him ready made. If you like to crochet, we have a free pattern for the sweet decorative bunny motifs. They are designed by our lovely visiting member of staff, Erika Hustler , who is staying with us for a few months from Switzerland! They’re lovely on their own or would look wonderful strung together as a garland. Don’t forget that we are closed on Easter Sunday. Many congratulations to the winner of last week’s prize giveaway , commenter “Bordergirl”, Irene Hurst of California! We’ll be sending your 3 bundles of Plant Dyed by Mehlsen out to you to enjoy! Thank you for the beautiful spring-filled & inspiring blog post. I’m going to make some of those rabbits. Hippity Hop !